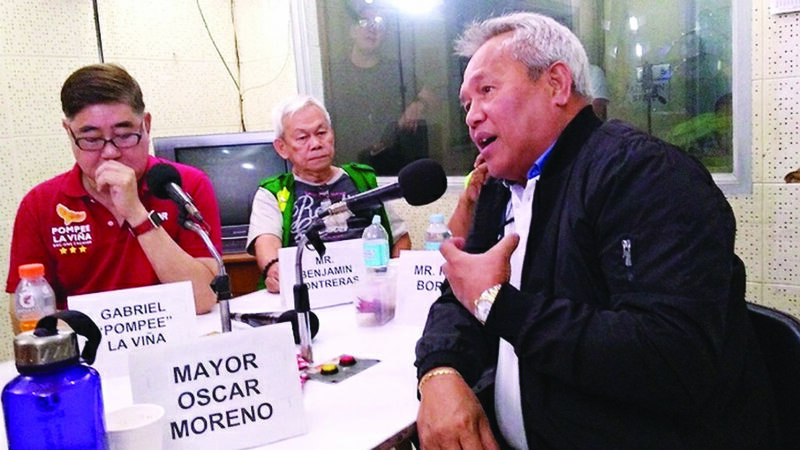 MAYOR Oscar Moreno promised sustainability while his challengers Benjamin Contreras, Felix Borres and Jose Gabriel La Viña promised change and improvement in city hall services during their on-air face-off at DxIF-Bombo Radyo here on Saturday night. Contreras promised clean governance which he said would result in solutions to most of the city’s problems. Contreras said he would rid city hall of graft and corruption if elected mayor. 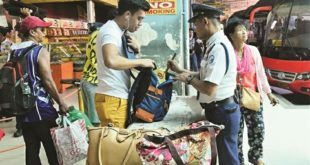 “Kinahanglan gayud malimpiyo nato ang atong pangamhanan sa gobyerno para itubag sa mga problima nato sa syudad,” he said. 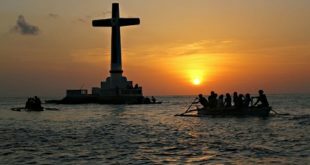 Borres, for his part, promised to create jobs for people living in the city’s outlying barangays, build seawalls and finish the construction of a major dike project, and develop a flood-control infrastructure network. He also promised to build a new hospital in the city and more health facilities. Like Borres, La Viña promised to improve health services in the city by fulfilling his mother’s dream of providing every barangay with physicians and nurses. His mother Inday once served as a city councilor. La Viña also promised to build a “City University” with free tuition for all. “Tanang bata sa Cagayan de Oro, dunay katungod nga mag-college. Sila tanan dunay ambition mag-engineer, nurse, mag-accountant, mag-abogado, mag-negosyante,” he said. La Viña said that if elected mayor, city hall would provide free WiFi and improved internet connection in the city. He promised to provide jobs for all the unemployed residents and implement more infrastructure projects like irrigation systems in line with the Duterte administration’s “Build, build, build” program. “Mga dalan, mga tulay, public transport, flood control, fast train nga diretso from Cagayan de Oro paingon sa Davao,” La Viña promised. He said city hall would provide housing for the homeless and there would be no backlog. La Viña also promised to bring back a new and improved “Night Cafe,” similar to what his running mate Vicente Emano did when he was mayor of the city. He said his Night Cafe would be “mas chada” in order to be a tourism come-on with a farmers’ and fishermen’s market. Reelectionist Mayor Mayor Moreno, for his part, promised sustainability. He said city hall would pursue its “Primehat” agenda if he wins a reelection. Moreno’s “Primehat” stands for poverty alleviation and peace and order, resettlement and revenuve generation, infrastractures and investment, metropolization, education and environment, hospital and health services, agricultural productivity and tourism, traffic and teamwork. Moreno said the Primehat agenda was started in 2013, and this would still be city hall’s direction in the next three years if he is reelected. While many things still need to be done, Moreno said city hall has been in the right direction. “Kinsa may nagdahom nga ang JR Borja [hospital] mahimong sama kadako karon where it was in 2013?” he asked rhetorically. City hall, he said, has just provided the local government-run JR Borja Memorial General Hospital eight intensive care units that would be functional soon. Moreno said he has also delivered on his promise to improve education based on the Primehat agenda. He said city hall built some 600 classroom-buildings, and opened up and concreted many roads in the city’s hinterland hinterland barangays.